A waiting area is available drivers who are meeting passengers. Look for the blue and white signs. Remain in your car while in the waiting area until it's time to pick up your passengers. Handicapped Parking - available in all airport lots. All airport-operated shuttle buses in the long term and economy lots are equipped with wheelchair lifts for passenger assistance. 2 hrs - $3, 2-3 hrs $4; 3-4 hrs $5; 4-5 hrs $6; 5-6 hrs $7; 6-7 hrs $8; 7-8 hrs $9. 1-2 hrs $3; 2-3 hrs $4, 3-4 hrs $5, 4-5 hrs $6; 5-6 hrs $7. Payment Methods: Cash, Visa, Master Card, American Express, Discover, Diners Club, and local checks. 4. 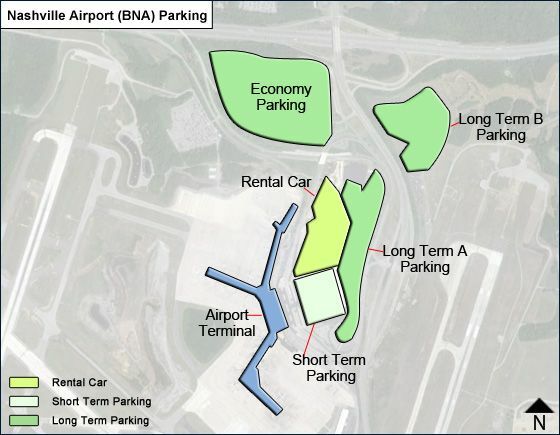 Valet Parking: A valet parking service at BNA operates from Ground Transportation Level. Directional signage on the airport roadways assist passengers in locating the area. Service is available during all hours of flight activity, primarily between 5:00 a.m. and 12:00a.m. Toll free number 1-877-482-5381 or 615-275-5381. Assistance with baggage to ticketing is available upon request. Smarte Cartes available in the valet area to assist passengers with baggage. Vehicles are stored in an uncovered lot. Three storage lots are available totaling 766 spaces. Passengers' vehicles are returned to the same valet area at the ground level upon receipt of claim ticket. Fees: $20 per day with a minimum of $8 for 0-4 hours. For further parking inquiries, please contact Central Parking (615-275-1045).